Srinagar: Fresh snow in the Banihal sector on Wednesday forced closure of the Jammu-Srinagar highway. “Right now, the highway is closed for traffic. The decision will again be reviewed depending on the weather,” a traffic official said. *Fresh snowfall closes Jammu-Srinagar highway*Fresh snowfall in the Banihal area on Wednesday forced closure of the Jammu-Srinagar highway.The Traffic Department was set to allow one-way traffic from Srinagar to Jammu on Wednesday, but the decision was reviewed as weather deteriorated all along the- nearly 300 km long road. "Nightlong rains triggered shooting stones in some portions of the highway in Ramsoo-Ramban sector. "Right now, the highway is closed for traffic. 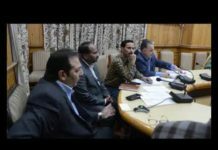 The decision will be again be reviewed depending upon the weather," a traffic official said.The Met has forecast widespread rain and snow in Jammu and Kashmir during the next 48 hours till Friday.